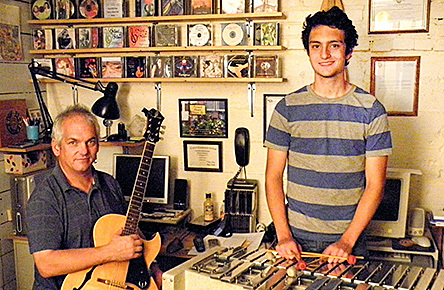 Paul and Thomas Hosford at work in the Painted Heart Music studio. Albion’s first recording studio, Bats’ Nest Studio, was started by Paul and Lori Hosford in their attic back in 1986, partly as a hobby and partly as a business venture. Paul had been building his own music recording equipment until then, but they made a major investment in a multi-track reel-to-reel tape recorder. Paul recalls having to “jump through a lot of hoops” with city zoning rules to start the business in a residential neighborhood. Many things have changed since then, but the studio is now marking its 30th year. The Hosfords moved to their current home on Fourth Street in 1993. The studio was moved to their basement and expanded to a record company, Painted Heart Music, in 2002. Many local and area soloists and groups have been recorded in the basement studio. Details in the Oct. 5 Albion News print and e-editions.